It happened on January 23, 1961, three days after the inaugural address by President John F. Kennedy. Three out of four safety controls were off. Speaking of a farce, PM Abe wore a protective suit with his name printed wrong ("安部" instead of　"安倍", both of which reads "Abe"), and Abe's supporters are indignant (like the political commentator quoted in ultra pro-LDP Sankei Shinbun's magazine), accusing TEPCO of this egregious, disrespectful mistake. According to the Sankei's magazine that carries the photo below, it was not just disrespectful but "it cast doubts over TEPCO's crisis management skills". Big deal. Clearly Mr. Abe didn't make a fuss over the wrong character and wore the suit. What's funnier to me is that Abe wore the name tag that declares he's the Prime Minister. As if that matters in dealing with the problems that have been constantly cropping up at Fukushima I Nuclear Power Plant since the day 1 of the accident. Prime Minister Shinzo Abe visited Fukushima I Nuclear Power Plant on September 19 and requested TEPCO's President Naomi Hirose to decommission Reactors 5 and 6. By decommissioning the entire plant, not just Reactors 1 through 4, Prime Minister Abe hopes to accelerate the whole response to the accident, including the problems of contaminated water. President Hirose said he would decide within this year, but it is likely that he will agree to the request. During the meeting with President Hirose, Prime Minister Abe demanded 1) decommissioning of Reactors 5 and 6; 2) allocating enough budget that can be used at the discretion of the plant management; 3) time limit on decontamination of contaminated water. As to the budgeting, TEPCO has already secured 960 billion yen [967 million US dollars] for countermeasures for contaminated water and decommissioning. President Hirose said his company will secure additional 1 trillion yen [1 billion US dollars, over 10 years]. As to the deadline for the treatment of contaminated water, he promised it would be complete by the end of the fiscal 2014 [that ends in March 2015]. The national government has allocated 15 billion yen [15 million US dollars] out of 47 billion yen [47 million US dollars] that the government will pay for the contaminated water countermeasures to build additional water treatment facility. Chief Cabinet Secretary Yoshihide Suga said during the press conference on September 19 that there was no plan to revise the support scheme for TEPCO due to the request for decommissioning [by the prime minister]. Suga said the government would do its best within the existing scheme, which includes Nuclear Damage Liability Facilitation Fund. Minister of Economy, Trade and Industry Toshimitsu Motegi spoke to the press in Tokyo in the evening of September 19. He said, "We want TEPCO to make effort to secure the fund," indicating he is not going to allow additional monetary support this time. The current support system via Nuclear Damage Liability Facilitation Fund is only for paying the victims of the nuclear accident, and no money goes from the fund to deal with the accident. All the cost of decommissioning Reactors 1, 2, 3, 4 is being borne by TEPCO alone. By declaring the decommissioning of Reactors 5 and 6 at Fukushima I Nuke Plant, which are relatively new (operational since 1978 and 1979 respectively), TEPCO would have to immediately write them off on the asset side of the balance sheet, with the offsetting reduction in either the liabilities or shareholders' equity. That would mean nothing to these politicians. While TEPCO somehow has to earn that money to deal with the accident and decommission, these politicians are fed by taxpayers' money. If Mr. Abe really thinks decommissioning the entire plant all at once will "accelerate the whole response to the accident", he's in a fantasy land. (About the workers at Fukushima I Nuclear Power Plant not having enough food to eat, no blanket, no spare underwear) we feel sorry for the workers. But this nuclear accident, it is basically TEPCO's problem, not ours. So, no, we are not going to do anything about it as the government, like delivering necessities to the workers. I was watching the press conference live. My jaw dropped. But judging by the reaction at that time among the ordinary Japanese in Japan, I was clearly alone in thinking this would be one of the rare times where the government could actually be useful. Well, they couldn't even deliver decent food to the workers in March 2011. It's impossible for me to imagine they are capable of doing anything beyond food delivery, but they sure can talk. According to an emergency email from Nuclear Regulatory Authority that independent journalist Ryuichi Kino shares, the cause of the system stoppage is not likely to be known anytime soon as the maintenance staff cannot reach Monju because of landslides caused by Typhoon 18's heavy rain. Today (September 16), we at Nuclear Regulatory Authority received correspondence from Japan Nuclear Energy Safety Organization (JNES) that data transfer from the plant parameter display system of the Emergency Response Support System (ERSS) for Japan Atomic Energy Agency (JAEA)'s Monju Fast-Breeder stopped. (The data transfer stopped at 2:56AM on September 16, and partially resumed after 3:46AM.) JNES and JAEA are currently investigating the cause of the data transfer stoppage. However, because of landslides from heavy rain from Typhoon No.18, maintenance and repair staff cannot get to the Monju Plant compound. Therefore, it may take a while to determine the cause of the stoppage. We have already instructed JAEA to secure the collection and transfer of data via alternative means such as telephone, FAX, email if a problem arises at the nuclear facility before the ERSS data transfer system is fully restored. According to Asahi Shinbun (9/16/2013), there were two landslides near Monju, with one of them at the entrance of a tunnel 1 kilometer from the plant. There are several nuclear power plants in Japan which are only accessible by one road and/or a tunnel - Monju, Tsuruga Nuclear Power Plant, and Ooi Nuclear Power Plant. Accessibility to the site in case of a problem is not included in the conditions for restarting the nuclear power plants in Japan. By the way, in terms of accessibility, TEPCO's nuclear plants including Fukushima I Nuclear Power Plants are one of the best nuclear plants in Japan, and still the earthquake and tsunami led to the disaster we continue to face at Fukushima I Nuclear Power Plant. (UPDATE-3) It looks like Typhoon No.18 will miss Fukushima I Nuke Plant. 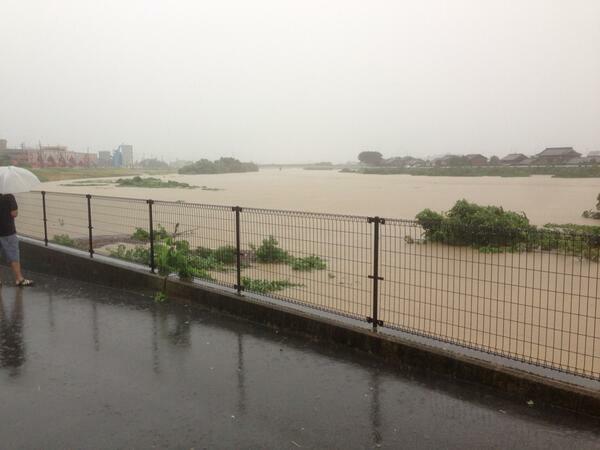 It is expected to pass south of Koriyama City and continue its north-eastern path. (UPDATE-2) 100 millimeters/hour rain in Shizuoka and Aichi Prefectures. Tornado warning in Kanagawa Prefecture. Heavy rain and wind to intensify in Kanto and Tohoku in the afternoon of 9/16/2013. (UPDATE) According to NHK, Kyoto City issued an order to evacuate to 146,000 residents in the four Special Wards (Minami, Ukyo, Nishikyo, Fushimi) at 8AM, September 16, 2013. Fukushima on course afterwards, it looks. NHK reports that Kyoto City government has issued "recommendation to evacuate" to more than 40,000 people in one Ward alone (Fushimi Ward) in Kyoto City. Even before the typhoon lands, Kanto Region and southern Tohoku have been experiencing heavy wind and rain since September 15. At Fukushima I Nuclear Power Plant, the rainwater that had rapidly accumulated inside the 30-centimeter-high barrier around the RO waste water tanks went over the barrier in the afternoon of September 15. TEPCO is examining the water to see if it contains radioactive materials, according to Jiji Tsushin (9/15/2013). As of July 2013, Cs-137 in monthly fallout in Tokyo is 4.4MBq/km2, and Cs-134 is 2.2MBq/km2. Atmospheric nuclear testing by the United States, the Soviet Union stopped after 1963 Limited Test Ban Treaty, but France, not being a signatory, continued until 1974, and China until 1980. 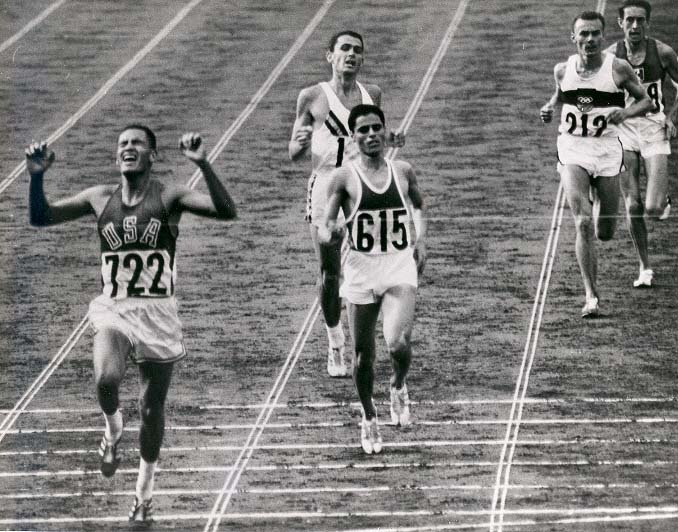 Billy Mills (USA), winner of 10,000 long distance run, who overcame prejudice and discrimination (he was a Native American) to win a surprise win in the Olympic (according to Japanese wiki; no such information in English wiki). 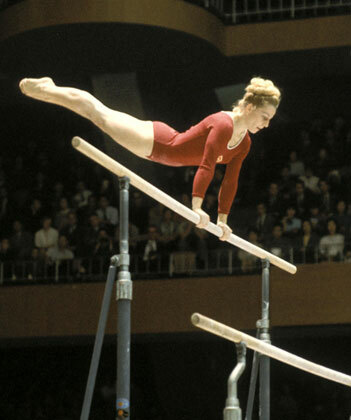 Czech gymnast Věra Čáslavská, who enthralled the Japanese and the world viewers. 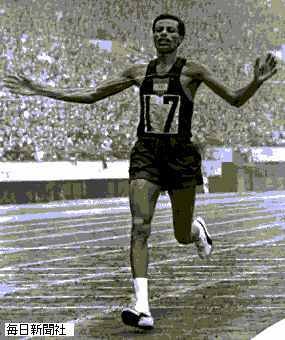 Ethiopian marathon runner Abebe Bikila, who had run bare-foot in 1960 Rome Olympic; in 1964 Tokyo Olympic, he wore Puma shoes. After the marathon, he said he could easily run another 10 kilometers.